I’ve been postng bits and pieces over on Facebook about how Mocha’s been handling this winter, but today’s ride has kicked me into actually musing for a bit longer than a Facebook post. 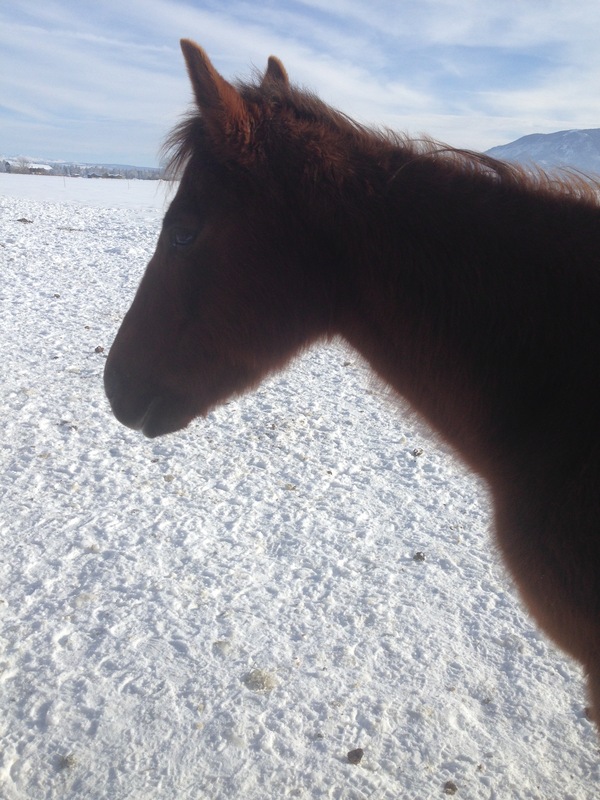 Despite a very cold and snowy winter, the little mare is thriving out on pasture. She’s maintaining her weight, hanging out with the herd, and appears to be content for the most part. This year her movement was more confined than last year due to snow depth and a couple of freezing rain spells which turned the snow into crusty stuff she had to posthole through. The barn owner hasn’t been able to feed as widely in the pasture as usual due to snow depth, and they’ve had to tamp down part of the snow to give the horses a chance to move about without having to fight the snow too much. December and most of January, it was simply too cold to ride. I’d go out to the barn and bring her up for grooming, check on how she’s doing, and a feed of grain. The “grain” is more of a forage supplement, a senior feed with more pelleted grass, beet pulp, and other stuff rather than sweet feed to make her hot. Unlike last year, she’s not the farthest horse out, but is generally close in or in the middle of the herd. I’ve still not gotten her to come up to the gate but some of that is her own wish not to go by other, more dominant horses in the field. Once the way to me is clear, she’ll usually walk up to me. A big improvement over last year. However, there just wasn’t much to do, and she radiated the attitude that if we weren’t going to ride, she’d just as soon be back out with the herd. A lot has changed from last year. She is overall happier in how she relates to everything. I don’t think she’s in pain any more; not sure if that’s a result of monthly Adequan shots or if that means between her feet finally getting to where they should be and something more than her hocks fusing or what. Her fore feet are getting wider–non-horsey husband noticed this yesterday when he came out to administer her shot. His comment was that “her feet look like horse feet should look now.” Even on wet ice she moves more confidently. Today she was doing a better job of keeping her footing than I was. She has become more confident and independent-thinking. I’ve noticed that in how she observes things around her. She notices different things, but doesn’t get as fazed as she has been in the past. Oh, Mocha is still a good equine citizen. She respects human space; she hasn’t turned into a reactive idiot. But she has learned to fend for herself without human support and has become more of a horse over this past winter. The other piece is that she still likes to work under saddle, and has been chafing at the restrictions ever since I started riding again at the end of January. Until this week, we were limited to the spaces cleared for feeding and a couple of tractor tracks through the snow. The arena was buried under deep snow, and the road was just too iffy to try riding. Even with riding the tractor tracks, any chance she had where the footing was semi-decent, she wanted to move into a trot. I did try doing some ground driving with her in January but gave it up because she made it clear that she really wasn’t into it, and wanted to do more. Oh, she was compliant, but I got a lot of disapproving grunts and sighs as we worked in the barnyard. It wasn’t what she wanted to do and she was quite vocal in that disapproval, complete with longing gazes toward the road. Throw a saddle on her back, though, and even with our restrictions, there were no grunts or sighs. So. Today. The weather was cloudy with a sunbreak that promised some decent riding conditions when I headed out to the barn. Um, well, the weather was moving in a different direction, and it started sprinkling when I got there. But I was determined to get some saddle time, and had put on rain clothes to stay dry. There wasn’t any deep snow left in the pasture, but there were slick icy spots and I decided that nope, pasture ride wasn’t going to work. Especially since the last time I rode, she kept trying to break into a trot where she could. The arena was snowbound and had melted icy spots. That left the road. Once I got up on Mocha and turned her toward the road, she was up on her toes. Not like a spooky horse looking for an excuse to bolt, but a winter-fatigued horse eager to get out of the pasture rut and someplace where she had solid footing that wasn’t ice and snow. She marched down the road at a pretty good walk, with the only catch coming when we passed the house with the big German Shepherd. That made her want to turn back, so I dismounted and led her by, then remounted. We got to the little gravel lane that ties into the road network I like to ride, and the moment her hooves hit that gravel, she wanted to prance and trot. Of course, at that corner is where a dude and pack string lives, and they were winter fatigued, bored with winter pasture, and very happy to talk to a visiting horse. We minced by that herd, and then she wanted to line out in a serious long trot. That would be fine, except after about 20 yards she started to try to slip a lope into the mix. Um, no, not at this phase of getting back under saddle. We settled on a nice little working trot, though I did have to stop her every now and then to let her settle. Again, not running away…just exuberant energy at being able to move without ice and snow. I did make her walk a little, worrying about her overdoing. At least she wasn’t overheating because about halfway through, the skies opened up and we got pelted with cold rain and wind. That was probably a good thing because she did want to GO, and she still has a long coat. Due to her energy, there were comments along the lines of “WHOA, DAMNIT.” “QUIT, DAMNIT.” “Silly mare, stop being an idiot.” But I was grinning the whole time, simply because she’s sound, she chose to round up under me and use herself, and she had all that energy but was still listening. I’ve got my good saddle mare back. YAY.